It wasn’t her birthday, but President Susan Hockfield received a cake placed in her office by a group of hackers yesterday, continuing the tradition of creative welcomes for MIT presidents on their first day. The cake was in the shape of MIT’s great dome, complete with a replica of the Wright brothers’ flyer on top, and a plastic policeman. A group of students identifying themselves as the ones responsible for the hack requested anonymity but said that when the group asked Hockfield what she thought of the cake, she said that she liked it. The students also said that Hockfield said her first day was a success and that people have been very welcoming and enthusiastic. Hockfield’s first day as president concluded with a lively reception in the Stratton Student Center from 3:30 to 5:30 p.m. Attendees were greeted with balloons, free food and drinks, live music, and Tim the Beaver as they meandered around the first three floors of the building. Hockfield arrived around 3:40 p.m., and a reception line quickly formed outside of the second floor lounge. Students and faculty waited for a chance to greet and speak with the new president, while the Mark Greel Band played jazz music on the first floor. “It feels fantastic to finally be here,” said Hockfield, though she also said that time had passed very quickly since Aug. 26, the date of her appointment. 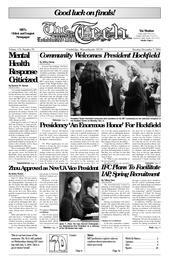 During her first day as president, she met with a variety of people, and talked to some reporters, Hockfield said. She also had lunch with the Institute’s department heads, where they discussed her observations from the past three months and the enormous confidence she has in MIT. “They were a great group,” Hockfield said. When asked about any immediate goals or plans she has, Hockfield said she would like to increase interdepartmental communications. Hockfield has also met with the Student Advisory Board, who will present her with students’ positions and opinions about important issues on campus in several lunches this winter and spring. Music from the jazz band was interspersed with performances by several of MIT’s a capella groups. The Muses, an all-female group, were the first to sing, and opened with the short but well-known Beaver Cheer. Afterwards, the group had a chance to talk to Hockfield. “We said we were excited that she was MIT’s first female president,” said the Muses member Frances W. Weld ’05. “She said it’s an honor to be the first.” Hockfield also said that it was interesting how it wouldn’t be that much of a change at other universities, but for some reason it’s different at MIT, Weld said. MIT’s Resonance also had a chance to speak with Hockfield after their performance. “She was very interested about all the a capella groups at MIT,” said Resonance President Stephen S. Lee ‘05. She mentioned that Yale has sixteen a capella groups, and said she was looking forward to hearing the different types of music from MIT’s groups. When Hockfield learned that graduate students were also welcome in the group, she jokingly replied, “What an innovation to have grad students involved in campus activities!” said Lee. The all-male group the Logarhythms sang last, performing songs such as Modest Mouse’s “Float On.” Later, they surprised Hockfield by surrounding and serenading her with an impromptu performance of “Babyface.” “[Hockfield] said she had heard a lot of a capella singing, and hoped to hear more, but from a farther distance away,” said Logarhythms President Douglas H. Fraser ’06. Hockfield is replacing Charles M. Vest, who held the position for the past fourteen years. When Vest assumed the presidency in 1990, hackers welcomed him to MIT by hiding the door to his office behind a fake bulletin board.